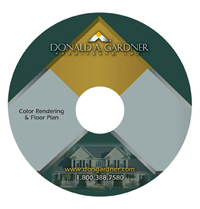 Promote your Donald A. Gardner construction projects with Professional Marketing Products! Want to "wow" potential home buyers with professional sales material? Looking for high-quality marketing tools to showcase new homes? We've got you covered! Add Donald A. Gardner's personalized marketing products to your "promotional tool belt" and sell your homes faster! For more information or to place and order, call 1.800.388.7580 Monday through Friday, 8am to 5pm ET. 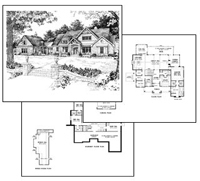 Capture your clients' attention with a beautiful 11" x 17" full color rendering, inset with the floor plan and plan name, suitable for framing. Leave your prospects with a lasting impression! 8.5" x 11" full color or black and white handouts include front rendering, floor plan, square footage, short description and your company's logo, name and phone number. Plan pages are printed on 90lb. card stock, and sold in quantities of 50 and 100. Market your company and boost pre-sells with this durable 2' x 3' full color laminated Job Site Sign for homes in progress. Signs include front rendering, floor plan, your company's logo, name and phone number. 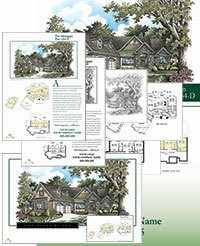 Donald A. Gardner renderings and floor plans can be added to your website, print advertising or marketing pieces. Some restrictions apply. 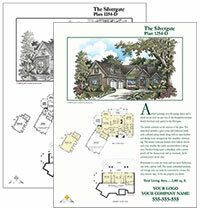 Develop your own ads and handouts with these 8.5" x 11" black and white renderings and floor plans. Our Pre-Sell Package has everything you need to start promoting your projects. 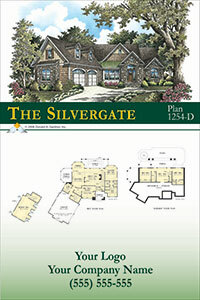 This package includes one 11" x 17" Presentation Print, fifty color Personalized Plan Pages, one 2' x 3' Job Site Sign and one Digital Color Rendering with Floor Plan. Rendering refers to existing DAG renderings only. For custom renderings (Pen & Ink, B&W and Color) add $750. Custom rendering needs only to be purchased one time, then can be used on any of the products listed above at the rates quoted. Products ship within 5-7 business days. Job Site Signs ship within 14 days. All prices for printed products do not include shipping cost. Marketing Products are licensed to builder/developer/realtor use only, to promote local construction projects.